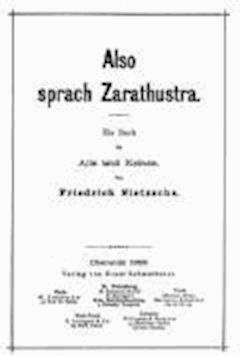 Thus Spoke Zarathustra (German: Also sprach Zarathustra, sometimes translated Thus Spake Zarathustra), subtitled A Book for All and None (Ein Buch für Alle und Keinen), is a written work by German philosopher Friedrich Nietzsche, composed in four parts between 1883 and 1885. Much of the work deals with ideas such as the "eternal recurrence of the same", the parable on the "death of God", and the "prophecy" of the Overman, which were first introduced in The Gay Science. Described by Nietzsche himself as "the deepest ever written", the book is a dense and esoteric treatise on philosophy and morality, featuring as protagonist a fictionalized Zarathustra. A central irony of the text is that the style of the Bible is used by Nietzsche to present ideas of his which fundamentally oppose Judaeo-Christian morality and tradition. Since humanity came into being, man has enjoyed himself too little: that alone, my brothers, is our original sin! And when we learn better to enjoy ourselves, then do we unlearn best to give pain to others, and to contrive pain.